Even in a winter as odd as this one has been, I love me some comfort food. Now, lasagna is high on that list but often gets bumped down for two reasons: 1) level of effort, and 2) the kids won’t eat it. In the past few years, great strides have been made to reduce the level of effort, primarily due to the development of “no boil” noodles. Prior to this fantastic innovation, many a lasagna chef had spent half the time assembling their lasagna wondering if they’d just burned off their fingerprints. Not much can be done to fix the problem of the kids not wanting to eat it other than time and continual attempts. At 2 and 5, they’re still well into the “hating mixed foods” stage, and I’m not quite certain just when that will end. With my sister out of town for her annual pilgrimage to a Doctor Who convention, I thought it might be fun to have my BIL down for dinner and cook one of his favorites. I felt a little out of practice, since it had been a while since I’d made lasagna, but thankfully it’s just like riding a bike. Well, maybe not so much for me – I still don’t know how to ride a bike. So, you can chop some time off this recipe by simply refusing to make your own sauce. If that’s how you want to roll (and I have no complaints if you do), I suggest you aim for the Barilla Marinara. It’s got a good consistency & a good flavor, and it’s my “all-purpose, go-to” sauce for weeknight cooking. A couple jars of that should sort you out just fine. Alternately, you can follow the directions below to make the sauce and the filling simultaneously, then assemble once you have the sauce & filling ready to go. One other note: this is not an exceptionally saucy lasagna (it’s not dripping in sauce and leaving oodles of runny sauce in the pan). If you want a saucier lasagna, just add/make more sauce – to your preference. Want to make this vegetarian? It’s soooo easy. Just substitute for the ground turkey with another type of mushroom, for some variety; chopped portobello would do the trick here. It’s nice and meaty, and it will add some more heft to the lasagna that just adding more white mushrooms won’t really accomplish. I apologize that it seems so complicated – there are a lot of steps. BUT, it’s not REALLY THAT complicated; I break a lot of the steps down into itty bitty bits to make it easier to figure out what needs to get done. Typically, I find the work rewarding; when the return on your time investment is a nice hot pan of yummy lasagna, that’s one fantastic ROI. GP1. Peel and mince the garlic and shallots; reserve half for the sauce and half for the filling. GP2. Wash the mushrooms and remove the stems. Chop the mushroom caps into small pieces (no more than 1/2″ long and 1/4″ wide). S1. In a stock pot or dutch oven (I use a Le Creuset enameled cast iron one for this), heat the olive oil over medium heat. S2. Add the basil and the sauce’s half of the garlic and shallots to the pot; stir briskly to combine. Let this cook for 1-2 minutes. S3. Add the tomatoes (including the water in the can) to the pot; stir well to combine. Cook for about 20 minutes, stirring every few minutes or so while the liquid is reduced. S4. Add the tomato sauce, tomato paste, oregano and parsley; stir well to combine. Cook for about 20 minutes, stirring every few minutes or so while the liquid reduces some more. F1. In a large non-stick pan over medium-high heat, brown the ground turkey. Use a bulb baster to remove any grease that bubbles out as the meat cooks. F2. Once the meat is fairly close to done (very little pinkness is still visible), add the rest of the garlic and shallots to the pan, stirring well to combine. Cook for another five minutes before turning off the heat. L1. Pre-heat the oven to 375F. L2. Spray a 9×13″ baking pan (I use a glass – Pyrex – one for this purpose, due to the ease of clean-up) with non-stick spray. Put about half-a ladleful of the sauce on the bottom of the pan, spreading it out so that there’s a light coating at the bottom of the pan. L3. Place three of the Barilla no-boil lasagna noodles in the pan, side-by-side. You should have a small amount of space that’s unaccounted for; I carefully break one noodle in half and use one of the halves to cover that gap. L4. Next, put several dollops of the ricotta on each noodle with two large spoons, using the backs of the spoons to gently smooth the cheese out onto the noodle. Don’t worry if you don’t have full coverage; it all works out in the end. L5. Put one-half of the filling (F) onto the noodles, taking care to try to get it evenly over the entire span of the pan. L6. Put one-third of the mozzarella cheese on top of the filling, then cover with a couple ladlefuls of sauce to give a nice, light coating. L7. Place the reserved half-noodle down in the pan, followed by another three noodles, side-by-side. Press down gently on the noodles to get the sauce and cheese in the layer beneath to spread out a little. Repeat steps L4-L6 to make the second layer. L8. Put three noodles side-by-side and break off another half to cover the final gap. Pour the remaining sauce on top of the noodles, taking care to cover all of the top noodles with sauce. L9. Sprinkle the remaining mozzarella on top of the lasagna. L10. To put this in the oven, you want to cover it with foil. BUT, since, like me, you may have your lasagna pan filled mostly or fully to the top of your pan, you’ll want to “tent” the foil. One way to do this is to get a nice long sheet of foil, tuck it tightly under each of the handles at the end of the pan and then make a notch in the center so that it’s in the shape of a tent; another way is to use two pieces of foil and create the notch where they meet up. Either way, you don’t want the foil right on top of the cheese…since then you’ll end up with cheese on the foil and NOT on the lasagna. L11. For safety purposes, and to limit spillage, I also put the pan on a baking sheet that’s bigger than the pan; that catches any potential drips. L12. All this done, place the lasagna in the oven and cook for 50-55 mins. When cooking time is done, remove the foil and place it back in the oven, to give the cheese a chance to get browned. L13. Lastly, remove the lasagna from the oven and let it cool for 10-15 minutes before serving. 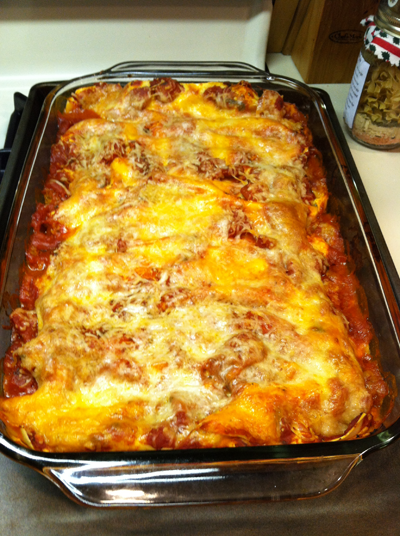 This entry was posted in entrees and tagged cooking, vegetarian by crunchymetromom. Bookmark the permalink.